In 2010, the MINI Countryman blazed onto the scene as MINI’s first-ever five-door compact crossover SUV. Very quickly, the MINI Countryman became one of the company’s best-sellers. And now, seven years later, the All-New 2017 MINI Countryman is poised to take another stride forward. It has been completely redesigned from the ground up. 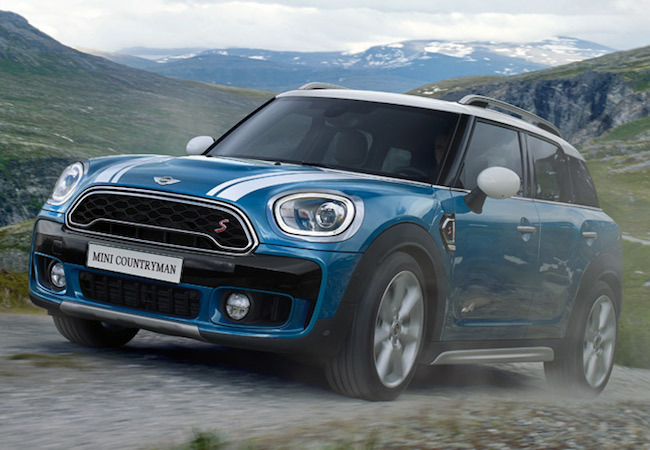 The 2017 MINI Countryman has a more mature, distinctive look than the first generation, heightening the bar for the competition in the Premium Compact marketplace. BMW’s refined influence is clear here, although MINI’s fun-to-drive persona shines through. The 2017 MINI Countryman has 30 percent more cargo space than the outgoing generation coming from its raised roofline and more flexible configuration inside. The rear seats both slide and fold and the trunk floor is height-adjustable for maximizing storage space. The interior is more spacious than ever before. There is more front and rear legroom, more front and rear headroom, and more rear shoulder room built in. In fact, the 2017 MINI Countryman leads its class in those categories! The newest Countryman is stacked with features and technology. Standard equipment across all models includes MINI Drive Modes, an electric parking brake, the MINI Connected infotainment system with 6.5-inch screen, Bluetooth capability for telephone, audio, and SIRI Eyes Free, automatic headlights, and rain-sensing wipers. Popular add-ons include the Wired Navigation Package with 8.8-inch touch screen navigation display that employs MINI Connected 5.0 and Qi wireless charging capabilities. For 2017, the looks and interior aren’t the only changes. The MINI Countryman is going to receive its first plug-in hybrid variant this year, called the MINI Cooper S E Countryman ALL4. A 3-cylinder MINI TwinPower Turbo Technology gas engine is paired with an electric hybrid synchronous motor to produce a total 221 horsepower and even better efficiency. The hybrid model will be released in June 2017. MINI’s electronically-controlled ALL4 all-wheel-drive system is standard on all 2017 MINI Countryman S, John Cooper Works, and Cooper S E Countryman models. It emphasizes that nimble, driver-focused experience MINI is known for. Whether you’re in the market for a premium compact crossover SUV or a fun-to-drive five-door vehicle with space to spare, you’ll find it in the All-New 2017 MINI Countryman. Experience it for yourself and book your test drive at MINI Richmond today. We look forward to seeing you!